In this new series we are going to be talking about hobbies from the collecting point of view; Hobbies that cultivate a certain amount of passion and in fact help develop it by degrees into something really addictive over the course of years. Approaching a hobby from this collecting point of view, it does two things for you. One, all that enthusiasm and passion is not quickly being burned out, but instead gradually and equally spread, tightening the grip on you with every single addition to your collection. And two, as common sense dictates, you are getting immersed into the process of adding to your collection, and with that value and enjoy each experience more as well as longer. Recreational mountain biking has always had that hard to explain appeal to me. Even before knowing how a trail really looked like, I had already developed love for the sport. I found the adrenaline rush everyone has been describing to be fascinating and the spectacle of the surroundings just as jaw dropping as well. But what fascinated me the most was the fact that once you get yourself immersed into this hobby you allow for the experience to grow better, richer, more satisfying as time goes by. The wide range of bike components and equipment to choose from, as well as the number of combinations you can come up with while improving your riding experience was impressive to say the least. This type of hobby choosing I suppose earns a certain admiration only from people interested in patiently investing in their experience over the long haul and, in addition, are going buck wild over the minutia of every next addition. How well do the breaks carry up to your expectations, how much punishing can a fork really take, how fast is a rear derailleur able to shift gears…? But before the biking bug bites, knowing the playground is imperative. I for one learned things on the go when a close friend of mine sold me the idea that mountain biking would be a lot of fun. Fast forward six years later and it proves he was right. When going over the first purchase related to this hobby, knowing something upfront or being willing to take advice from someone who is more experienced shows particularly apt. In this regard I consider myself very lucky- someone else has laid the bricks down for me, and I was hence able to decide accordingly. Albeit it is nice to predict the trajectory of your future additions, you can never know for sure how things are going to develop. Will you find more punitive trails more rewarding, or reserve your weekend for the smooth ride? It is best to leave things to time and adapt accordingly. Though, as I have learned even at the very beginning, there are certain rules you are conditioned to abide by, and disregarding some of them at the beginning shows to be a losing proposition. You may turn to be quite the adrenaline junkie and head over to the downhill camp, but an average beginner is best introduced to this hobby by tackling the all mountain and XC (cross country) first. Wearing a helmet and body armor may look a certain amount of fancy, but starting with anything else than a hardtail and some basic equipment is quite less than savory. Going for a chat with your local bike retailer sheds some light on this question, and allows you to have a clear perspective on what is that that you want. Going over this will direct you in decisions such as wheel size, fork travel, suspension in general, geometry among other things. What you should know at the very start is that throwing more money just for a good measure will not necessarily lead towards better experience. This question is, hands down, the one most widely discussed among bikers nowadays. And it confuses beginners a great deal. Namely, we are talking about the size of the wheels. Now 26”ers have their advantage when it comes to certain things like traction due to having more ground contact and speed in downhill rides due to the bigger diameter, as well as overcoming obstacles more smoothly and easily due to better angle of attack (how a tire hits the obstacle ahead). On the other hand though, we have 26”ers which provide more ease in handling thus a more agile ride, as well as the fact that the center of gravity is closer to the ground, making navigating through turns much easier and providing more stability and balance. 29”ers, have other drawbacks as well, among which is geometry issues with smaller riders and, as in most cases with beginners who chose to spend money on parts like derailleurs and brakes as opposed to stiff wheel build and fork, deflection. When it comes to beginners I would personally advise going with the 26”er, since it offers a wide range of options for you to choose between. You can hit almost any trail with confidence in handling, and uphill rides are usually easier. Besides, 29”ers are really big, and if you are a smaller rider you will have trouble getting used to the height, which for beginners usually translates into fear of letting the brakes off while going downhill. If you ask the average mountain biking junkie how an ideal scenario would be like, he will advocate buying the frame and then just adding the components on the go. This however, is possible only if you have components to transfer from another bike. The reality for beginners though is that they don’t. There are really couple of options to choose from, and I will try presenting you with two as for you to get the hang of how planning works. First, knowing that parts last longer i.e. you always transfer them once you buy a better frame, it would be wise to go for a configuration that offers exactly this- higher end components. But since complete bikes are built with the intent to fall into a certain category and thus price range, you will usually find frame quality matching components quality. The second option is to go for a model which offers better frame, and not focus much on high end parts. This is wise if you plan on changing the parts later on, but staying with the same frame. I, myself, prefer this route. Besides, it is way more fun buying one part after another, and thus improving your riding experience. Ask any biking aficionado and he will tell you that waiting for a new fork to arrive is something that cannot be described and you have to experience by yourself. Here goes the rule that you cannot buy unless you try. And your local bike retailer is the perfect place for doing a test ride. Retailers know how to find you a bike appropriate for both your height as well as style of riding. Hardtail, full suspension, hybrid… You can really get confused over what each of them does differently, but at the tail end of the discussion, beginners are better suited with hardtails after all. Besides, a decent full suspension bike goes way over 1000$, and makes you still compromise on other components. Then just test and see how things are going. You will get a lot of advice before continuing with your search. This is the most important part of your entrance in this hobby, so take your time and never rush. Return two, three, or more times if you feel the need to. The order of importance when it comes to components is rather obvious. Forks change quite a lot in terms of geometry, distribution of power and pressure; yet alone differently experiencing the smoothness or lack thereof from the ride. And since choosing a fork leaves a great deal of variety in experiences, so does the price respectively. Without doubt the commonly biggest investment in your recreational biking career. As for specifics, there are few noteworthy of mentioning even for those lacking the basic knowledge. I will try addressing travel, air or coil sprung, degree of adjustment available. When it comes to travel, hardtails are normally within the 100mm travel range. Although a fork can be changed, it is advised to stick with the manufacturers specs. Since say, adding a 150mm fork when previously having a 100mm is dramatically going to change things like geometry and maybe even damage the head tube over time due to increased leverage. As for starters I would personally advise going within the 100-120mm range. There are many great forks there to choose from. Now that we went over decisions concerning travel, let us discuss how you want the fork sprung. There are two options- air and coil. In recent years air suspension has come a long way, and most models on the market fall in this category. They are lighter, offer more adjustment and you have a many to choose from. Coil sprung on the other hand are heavier, harder to adjust, and with somewhat more limited offering to choose from. They are however cheaper. My contention is that you will aim for air at some point of your upgrade, since there really are no disadvantages. Another concern there is to be addressed is adjustment. Namely, we are talking about the option, or lack thereof, to adjust the travel as well as rebound (how fast a fork recoils to normal position after a hit), compression (how fast or slow does a fork go through its travel) and spring rate (controlling the amount of weight needed to compress the fork). There are different levels of adjustment available, and besides the basic ones such as adjusting the rebound and spring rate to a certain extent, you can also find forks that offer lockout which in addition can be remote or not and greater adjust rate of the already mentioned characteristics. Having somewhat of a fascination with lists, I would place this item second and in general vicinity of the level of difference a fork can provide for. And this is due mainly to the fact that I, myself, have had quite a hustle with brakes over the years. Reliable and fast responding brakes allow for a far greater comfort within the riding experience, as well as almost eliminate the exercise in frustration which comes hand in hand with lower end brakes. The options here are numerous as well. V-brake, mechanical disc, hydraulics… And they all have their pros and cons. The difference between V-brakes and discs is in some cases more notable than in others. Lower end disk brakes are usually waste of both money and unnecessary adding weight on your bike, while differences between disc models and moreover cable or hydraulics are more easily noted. V-brakes are lighter, work by rubbing against the rim thus providing stopping power. However, once wet they become far from reliable. Disk brakes work by compressing disks against a rotor mounted on the hub of your wheel. They are quite comparable to disk brakes on an automobile. Disk brakes are heavier than V-Brakes, not as simple, and much more expensive. On the upside, they provide more stopping power. Hydraulics’ are well worth the investment, since there is a big difference in using a fingertip pressure as opposed to a full grip on the brakes when we are discussing a longer ride. For the sake of enthusiasts not being easily impressed by wheels, I’ve decided placing them here. However, they are even more important than anything else if you think about it. Quality rims translate into more reliability, durability, are lighter, can take more stress; that, and much more. Though, for all intents and purposes, I will advise you to address all your questions and concerns regarding wheels to your local retailer, since it is really a complicated matter. If you ask me these are often times given more than the attention they actually deserve; at least when beginners are in question. It is not only hard to differentiate between, say, Shimano Acera and Alivio, or Shimano Deore and Sram X5, but also it makes a less noteworthy difference when price is taken into consideration. Shifters on the other hand, albeit allowing for a greater difference between models, are still not wise to invest into if you have other components not matching the quality, or worse falling in the lower end spectrum. This one is a must. A helmet can make the difference between a fall becoming part of your experience, or being the reason for your last ride. So choosing and buying the helmet is the first thing you do before hitting the track. Longer rides can result with unpleasant feeling and slight pain even. And on the long run it is wise to invest in this rather early. Shorts are best chosen according to your taste, since most entry level models provide the same protection. After all, hey, they look nice and fancy. Backpacks, glasses, gloves, shoes… These all account for things you will have to rely on, but you can make compromises early on by going with what you already have. Multi-tool, bottle, speedometer… these you will have to invest money into. Here are few ideas for equipment that will show you how much room for investment, and thus improvement to your ride and bike maintenance there is. And since we tried getting you familiarized with equipment, here is something when it comes to clothing. You thought your garage was somewhat empty? You like hanging in there by yourself, spending time working with tools? Great. There is a whole different obsession to be embraced if you go down this path. Investing into owning a repair kit or some tools at the very beginning can really go a long way. Two seemingly naïve, yet very important this happen- One, you save a lot of money by doing things by yourself; and two (what you will learn to appreciate a lot latter on)- knowing how to deal with problems on the road due to experience gained while being in the garage. Here are some ideas regarding what you can look up as time goes by. When it comes to investment, the rule of thumb is that the more you open your pocket the more live your passion remains. The opposite applies just as well. You can find some authoritative blogs on the net discussing the passion of mountain biking (like MountainBike, BikeRadar and Bike198…) and just subscribe or simply put them in your RSS reader. The more tangible and real experience, as well as a bigger addition to your collection and passion as well, is buying magazines. There are many great ones with remarkable quality when it comes to editorial standards and policy. You just find what interests you and start following. 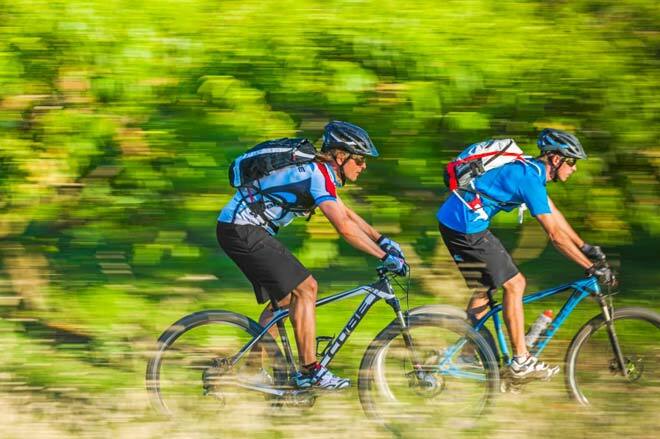 Another great thing to do which will ultimately broaden your knowledge in bikes and riding, as well as offer you some great hours of fun and socializing, is going on organized bike tours. Like the ones available with the Adventure cycling association, or with Bicycle Adventures. There are many more in fact, you just have to look for then and find one yourself. You see, the choices are almost limitless, which adds to the whole experience as a rider. Namely, you can never get bored and find your passion hitting plateau. This type of hobby, besides the physical, technical, and also social aspect of it, allows for a lot of room when variety is concerned, and provides incredible opportunities to flex your creative muscles around. Perfect for people having the kind of smarts that keep them up at night, and especially for those who find satisfaction in remaining passionate over a period of time as opposed to going head over heels with something and then experiencing a burnout. You know what? Here is the punch line – I dare you to buy some entry level bike, make one investment on equipment, clothes or components, and then stop. You will get the hang of what I was talking about.